Home >> Filtration Cartridges, Inline Filters & RO Membranes >> RO Membrane Elements & Housings >> CSM 100 GPD RO Membrane Element 1.8"x12"
This is a Thin Film Composite (TFC) residential RO membrane by CSM. It is capable of producing up to 100 gallons per day of pure water. 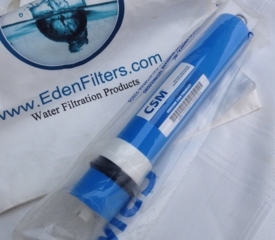 The TFC semi permeable membrane is the heart of any residential reverse osmosis system (e.g., RO5-100) as it rejects wide spectrum of impurities down to .0001 micron. An RO system, which normally has other components such as carbon filter, is supposed to remove salt and many contaminants from water. This standard size 2.0"x12� element should be replaced every 2-3 years depending on total dissolved solids (TDS) in the supply water. If TDS is less than 180 mg/L, replace every 3 years. If TDS is above 180 mg/L, replace every 2 years. A TDS hand-held meter can be used to measure the TDS of water. Knowing the TDS of purified water and the supply water, you can calculate the rejection rate of the membrane. If pure water has 50 ppm TDS and the supply water has 300 ppm TDS, then the rejection rate is 83%. A new membrane should have a minimum rejection rate of 90%.